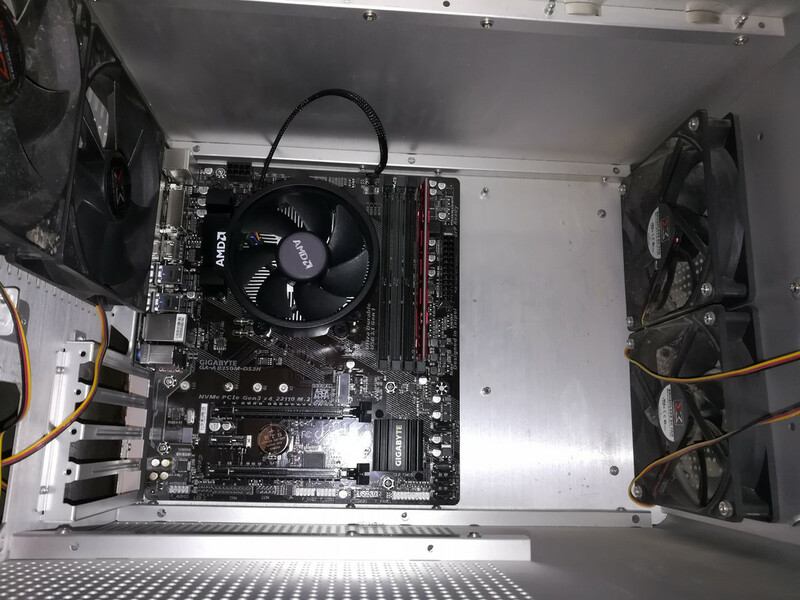 My i5 mobo took a hike so I had to use my i3 box while saving up for a new build. It was over 6 years old so I have a good run. This time I wanted to check out the AMD Ryzen CPU so I ordered a Ryzen 3 2200G CPU ($89), a Gigabyte GA-AB350M-DS3H MOBO (x370 ChipSet) ($65) and an 1x8 Ballistic Sports DDR4 MEMORY ($80). Turned out to be a really good setup and very similar to the i5, both quad cores and clocked the same almost but slightly faster because of the DDR4 memory. The i5 system was DDR3. I even got another drive like my main drive which is Seagate Constellation Enterprise 1 TB. Both are made in 2013 but the main drive was $120 and my new drive was $50 with a 1 year warranty from Newegg. The new drive is in a removable caddy. By the way, I replaced the i3 with the i5 CPU and it worked so the i3 system has been upgraded with the CPU, Memory (2x4) and the Video card (HD7770). All on the AsRock MOBO. It is now the Kubuntu (Linux) box. This time I'm using the 32 gig cache SSD as the main drive. Works quite well and loaded with plenty of drive left. Sorry to hear about the board going but glad you like the new. I know that were not supposed to be able to run w7 on those but how about Linux with that AMD Ryzen? Really? Ryzen CPUs can't run w7? That's unusual. That's the poop. And includes i-9 as well. Something about them. No drivers for the chips in w7. 8.1 and 10 is the one OS it is supposed to work on, that and any new versions that may come out. Also vista has nothing in it kinda like the old Pentium 1's. They can't run the newer OS. I think millennial or 2000 was as far as it would go. Pentium 2 would work xp, but not later. Drivers are the issue. My next computer will be a A series amd processor so I can use w7. I only play games on it. Everything else is on my w10. I am looking for a way to keep it from going on-line, but let w10 to go on-line. Seems if I stop one it messes up the other as well. Don't know why... Have fun my friend! I didn't know AMD didn't support W7 on Ryzen. That's good information, Dan. About Linux it seems that in 4.10 support for multithreading was added for Ryzen. As usual there are some bug reports as well. The main issue will be motherboarda for sure. There is always something that doesn't work (out of the box), especially in lower-end ones. That's what I was told. Can't remember where I got the info but I think it could be Cnet.com. don't hold me to that but I do remember reading about it somewhere. So my next computer will have a A series processor with ddr3 ram in it. Not sure if I should hold out for a A10 or A8. They had 4,6 and 8 cores in that series. In any 4 years from now, that "will" be old tech, but look what i put into my new..old computer. I think it's called cheap. That and able to make stuff work. I run a duel boot 2 hard drive computer. W7 on one and 10 on the other. I am still thinking about putting one of the Linux OS on the drive with w7. I can duel boot that drive as I only have my older games on it that will not work on w10. I think I am only using around 50 or so gigs. That leaves 200 gigs for another os to be run on that drive. After the last upgrade in April my copy of w10 have been for the most part rock study. Once it was good, I have 7 just for games only. Nothing else but music on it along with games. Anyway, once I figure out which copy of Linux I can start having fun with that. I almost wish i could put android on it. Not sure how that would work out. For Linux, get the latest. I have Kubuntu and it has software loaded to the gills to download for. It'll have an icon for you to click on when you have internet access. That site doesn't say much. The popular distributions are always the ones with the most graphical utilities. The actually good distributions are always at the bottom because they are not as "friendly" as the others. Arch and Gentoo are very good examples. If you wanto to find your distribution, ask around in forums. That's the best way. I have used Linux distributions long enough to know that all distributions are the same, except for the software versions, package mangers and the amount of GUI tools and preconfiguration they have.